Choosing a model railroad concept or theme may be very easy if you’ve been in love with a certain stretch of railroad that you grew up with in your home town; or it may be difficult if you just have a general idea that you want to build a railroad but don’t have any idea about the specifics. The latter of those scenarios is the way it was with me. My first layout didn’t really have a plan or a purpose, except that I knew I liked mountainous terrain, lots of trees and rocks, tunnels and bridges, over- and under-passes, with multiple trains weaving in and out of scenic areas. So I guess that was a start. As time went on, and as I learned more about the hobby and about railroad history, coupled with the fact that I live on the east coast and have visited the western part of Virginia, West Virginia, and the Blue Ridge Mountains many times, I began to form the theme for my current railroad. I always enjoyed my trips to Pocahontas County in West Virginia and the Cass Railroad, an old lumber-hauling railway in that area which has now been converted to a tourist attraction. The scenery is spectacular, especially in the Fall, literally exploding with color. There are many creeks, mountains, valleys, rock formations, etc, all of which I liked and decided I wanted to model. I picked up a book on the Pocahontas Roads, which was a history of the railroads in that area and found that Pocahontas County and the New River area were heavily populated by tracks and trains from multiple railroad empires, including C&O, B&O, N&W, Clinchfield and Western Maryland. This seemed like an ideal area to model because I would have the ability to run equipment from all those railroads on my trackage since they were all in that area anyway. I wanted to be able to run steam locomotives weaving in and around the mountains carrying lumbar, coal and general freight, but I also wanted to have high-class passenger service carrying VIPs to Greenbrier and Hot Springs and various vacation spots along the Blue Ridge. In addition, I liked the idea of using some of the early diesels to carry these passenger trains. The only realistic period of overlap of steam and diesel is in the late 1940’s and early ‘50’s. So, considering all of the above, my model railroad concept was gradually conceived - from a glimmer of an idea about the kind on scenery and locale that I liked into a full theme of what kind of trains I wanted to run, in what era and what the purpose of the railroad was going to be. I decided the era should be October of 1948, the year I was born; and the locale should be in Appalachia, specifically, connecting to the C&O, B&O and N&W at the northern end, and extending from Pocahontas County through and on top of the Blue Ridge Mountains and connecting to the Southern Railway at the lower end of the Blue Ridge. The purpose of the railroad would be to haul lumber from the mountains to the sawmills and then to furniture stores, to haul coal from the mines to the power companies and residential coal yards, and to carry passengers and freight through beautiful mountainous terrain from one town to another. I wanted this to be a fictitious, free-lanced railroad so I wouldn’t have to specifically replicate any particular scenes of the C&O, B&O or others, but it had to be based on reality, and it had to capture the essence of the area and the railroad operations that existed there. When my model railroad concept initially gelled, I didn’t have a large room available to me. So I set up a small table (an old damaged dining room table) measuring about 3x6’. In order to get any significant empire on this small of a space, I decided it would have to be N-scale. Part of this decision came from the fact that I liked to have a lot of scenery for my railroad to run through. I had always done HO scale before, but I thought it might be time for a change in scale anyway. Naming the railroad has also been an interesting process. My original 3x6' layout was intended to represent Pocahontas Roads (nicknamed "Pokie Roads"). As the layout expanded to encompass an entire room, however, it seemed appropriate to imagine that this original small railroad was purchased and engulfed by the larger Blue Ridge and Southern, also fictitious, but helpful in describing the essence of the railroad. The smaller original, central 3x6' section of the layout is now called the Pocahontas Division of the BR&S. And so my own model railroad concept was born, the “Givens and Druthers” were noted, and I was ready to go! 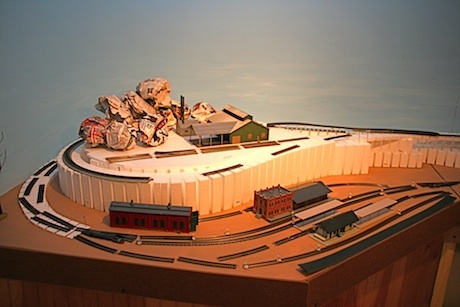 From "Model Railroad Concept" to "My Train Layout"
From "Model Railroad Concept" to "HomePage"